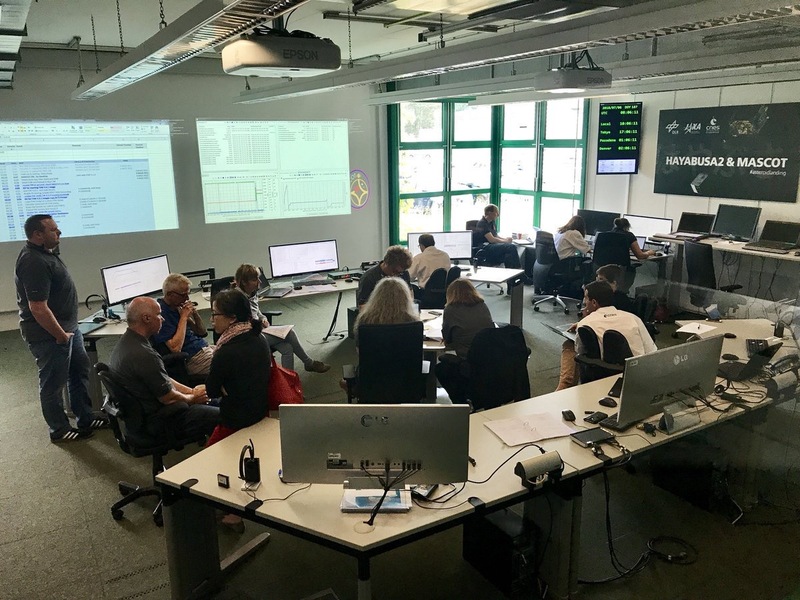 The teams reset the version of the onboard software that will be used in operations using the ground station antennas proposed by the JAXA Hayabusa2 team. This flight software will drive Mascot's various systems. They also performed Mascot's health tests, lighting the instruments one by one to check their operation. Everything is nominal. Finally, Mascot is plugged into the Hayabusa 2 probe to save battery power throughout the cruise. Therefore, the teams switched it back on (first depassivation) to verify that it is in good working condition for the next scheduled operations on Ryugu in October. MASCOT is alright and all lights are green for future operations. 26 July then end of August and mid-September for 2 dress rehearsals of separating operations in collaboration with JAXA. From 29 July, beginning of the operations of landing-site selection (space mechanics). The Mascot control centre at the DLR in Cologne.